Do you think that every jewelry book that could possibly be written already has been? Then this post isn't for you! If, however, you look at the vast array of jewelry and beading books out there and think, "I could contribute to that...I've got good ideas!" then keep reading. 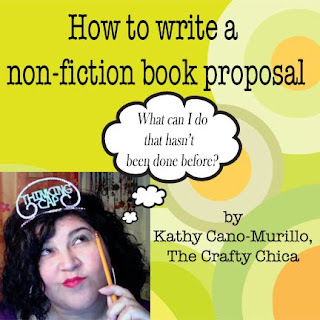 Kathy Cano-Murillo, well known as the Crafty Chica, wrote "How to write a non-fiction book proposal." Let me warn you: it's not quick or easy. But if you are bursting with things to say and ideas to share that haven't been said or shared before, Kathy's article is a good place for you to start. Kathy knows what she's writing about. She has seven published craft books. So far! Awesome!!!! Thanks Cyndi, this is something I definitely want to read! Thanks for doing the research for me ;-)!